Rhinoceros Auklet carrying sand lance. Photo by Peter Hodum. Protection Island National Wildlife Refuge is located in the Straight of Juan de Fuca and harbors one of the largest nesting colonies of rhinoceros auklets in the world. The 364-acre island is closed to the public to protect the island's high density of birds and other wildlife. According to the US Fish and Wildlife Service, more than 70 percent of the seabird population of Puget Sound and the Strait of Juan de Fuca nests on the island. This brief recording captures the interaction between two nearby rhinoceros auklets and a nearly fledged chick on Protection Island at approximately 2 AM on July 26, 2012. The birds were recorded by Jeff Rice for the Encyclopedia of Puget Sound and the soundfile is available for download under a Creative Commons Attribution-Noncommercial-No Derivative Works 3.0 United States License; http://creativecommons.org/licenses/by-nc-nd/3.0/us/. 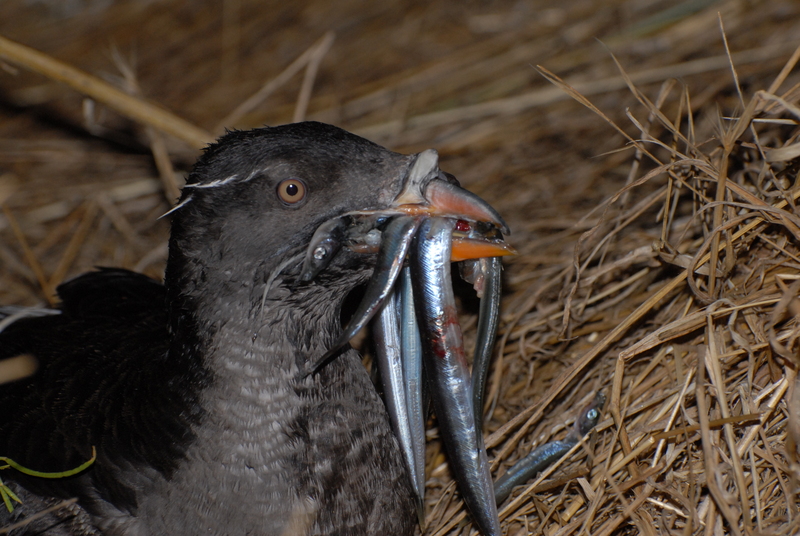 Download an extended recording of Rhinoceros Auklet vocalizations and wing sounds. These recordings were made in cooperation with the Washington Department of Fish and Wildlife (WDFW), which generously allowed us to visit the island. Special thanks to Scott Pearson of WDFW and Tom Good of NOAA Fisheries, who provided valuable advice and assistance in determining recording locations. Jeff Rice is Managing Editor of the Encyclopedia of Puget Sound.